Charles Doughty-Wylies' letter quoted from Gertrude Bell: The Arabian Diaries 1913-14 pp 25-7. 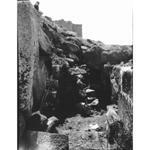 Photograph I_246 (1907) - Gertrude Bell Archive, click the marker to view the photo. "It's pretty hot but one sits out in their big garden under the trees and Löytved and others drop in to call." Letters 18/7/1907 - Gertrude Bell Archive, click the marker to read the letter. An example of a Hittite inscription from the dig is shown in G_105. The background is based on G_090 and G_092. AlbumG (1907) - Gertrude Bell Archive, click the marker to view the album. "The more I looked at it the queerer it became and the less I thought it could be Christian or anything that I knew so I took it down with great care, curious rabbit-headed things and winged sort of crosses and arms and circles, and with some trembling I showed it to R."
Letters 25/5/1907 - Gertrude Bell Archive, click the marker to read the letter. The church on the summit of the Kara Dagh (p. 241) seems to have been built on the site of an old Hittite High Place which was almost totally destroyed or covered up. The Thousand and One Churches - at archive.org. Gertrude Bell describes her visit to the Carchemish excavation, and meeting with T.E. Lawrence.
" I went there - it was only 5 hours' ride - and found Mr Thompson and a young man called Lawrence (an interesting boy, he is going to make a traveller)"
Letters 21/5/1911 - Gertrude Bell Archive, click the marker to read the letter.
" Uncle Tom is a most amenable and agreeable fellow traveller - but how he ever gets along when he travels by himself, passes my imagination... However it doesn't matter, as Papa is the best traveller in the world and arranges everything." Letters 7/4/1899 - Gertrude Bell Archive, click the marker to read the letter. "Hot sun and cold wind. Up pretty early. After breakfast drove with Papa to the German School where we presented our letter from Sir Edwin E."
Diaries 8/4/1899 - Gertrude Bell Archive, click the marker to read the entry. This map is based on several letters and photos in the archive, click the marker to explore the full list. Photograph Y_501 (1914) - Gertrude Bell Archive, click the marker to view the photo.